Print a Sea-game game board. Let everyone know the symbols that show up in circles on a game board. Two special symbols on lines and the meaning of exclamation mark. See below. Basic music: At any given time, a player "is inside" a circle on a board or in transition between circles. When in a circle you need to follow symbols that are there. 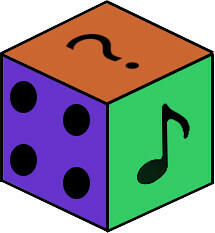 There are four types and they relate to two aspects of music: hat and boot tell you to play high and low sounds, then a dot is for short and a line on three sides of a dot is for long sounds (in the horizontal version of the board visible on the right, all these symbols are seen in the top-left circle on the board). You start at the circle of your individual choice. Then, at the time you see fit, you go to another circle that is connected by a line (there are 7 lines on the board). Advanced music: Method of your musical transition is also marked with symbols and if this part is not too difficult for you, you should obey the symbol close to the circle that you leave (on a line that you follow that is). The symbols that should be interpreted musically while doing a transition to different circle are mostly the same as used in cue-cards deck. For example if you just finished playing long and short sounds in top-right corner, and planning to play high and short sounds in bottom-right corner, you should make a slow transition between the two. Two symbols specific for this game might be interpreted musically in many different ways. 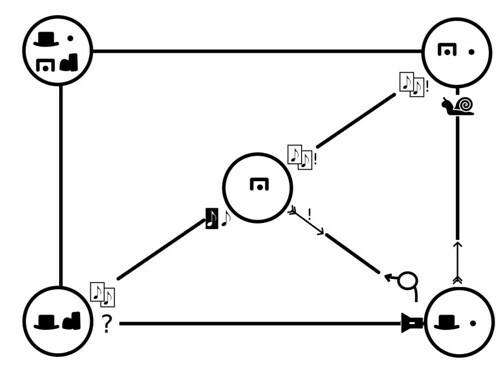 These are: question mark (interpreted when traversing along the bottom from left to right) which means "Provoke comments", and an arrow with a circle (for movement from bottom-right to middle circle) which is to be interpreted as "Pass indirectly". 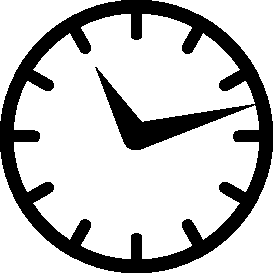 An exclamation mark by the transition symbol means that it should be strongly interpreted. For example an arrow (archery kind) is related in the original score to the "Pass quickly" directive and exclamated arrow relates to "Pass suddenly and directly". 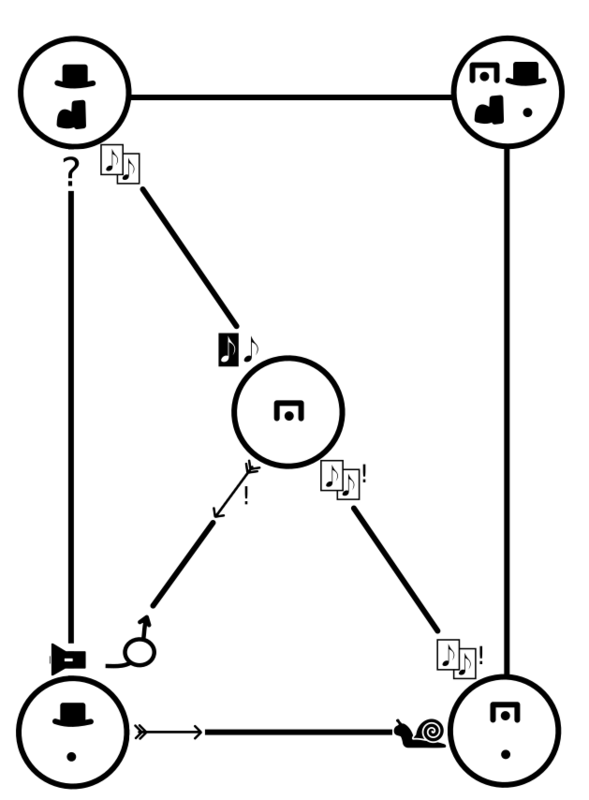 (In the original Sea-game score every direction is given by text, consider consulting it if graphical directions are confusing to you). Game (added part): You can go around the circles whatever route you prefer. Your first task is to visit every circle on a board (but you don't have to rush for it, and can also wander around and try stuff out). After you played all the circles, now try to meet everyone in one circle. Listen to others and go where they are and also let them find you. If someone thinks that every player succesully met each other in one circle, he or she should point to that circle on the board. Now everyone gracefully finish their part of music, and after music stops you can confirm if everyone indeed made it to the shown spot or not. This game is based on Carl Bergstrøm-Nielsen's Sea-game (1976). Arranged and published with the kind permission from the author. You can see the original score of Sea-game at www.vbn.dk. The Sea-game game is published with the license: Creative Commons 4.0 BY-NC-SA. Proper attribution requires a link to this wiki page and to the permanent place for original score from the link above.